Action from Posh's home drubbing at the hands of Southend. Photo: David Lowndes. Peterborough United’s League One play-off hopes are hanging by a thread after a dismal 4-1 home defeat at the hands of Southend United tonight (February 21). The Shrimpers confirmed their place in the top six and extended their advantage over Posh to six points, It may as well be double that as Posh look like a beaten team resigned to the fate of another season of third tier football. Substitute Tom Nichols fires home the Posh consolation goal against Southend. photo: David Lowndes. A goal on the stroke of half-time from full-back Jason Demetriou gave Southend a lead they deserved and two goals in four second-half minutes from Marc-Antoine Fortune and Anthony Wordsworth effectively sealed the points. Posh substitute Tom Nichols claimed a consolation goal 10 minutes from time, but it was too little too late. Southend even broke away to score a fourth goal in injury time through Michael Timlin. 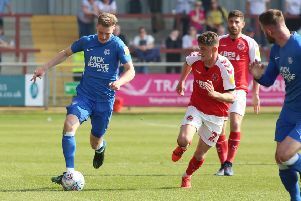 Posh manager Grant McCann’s team selection was one of the more eagerly-awaited of the season with so many midfielders ruled out. Ironman Michael Bostwick returned just 24 days after breaking his jaw, on-loan Martin Samuelsen was given a rare start, while central defender Jack Baldwin came back for his first start since November and was handed the captain’s armband. Posh striker Junior Morias sends a header goalwards in the 4-1 defeat by Southend. Photo: David Lowndes. The midfield diamond was also back and for the opening 10 minutes Posh were bright with Craig Mackail-Smith getting behind the Southend defence twice. Junior Morias saw a shot well blocked by Adam Thompson on the first occasion. But the game soon settled into a familiar pattern with Posh struggling to make any inroads into the visiting defence, while often looking defensively stretched themselves. A strong breeze appeared to trouble both sides with Ryan Leonard somehow failing to convert a back-post sitter from a free kick. Bostwick, Ryan Tafazolli and Baldwin all made decent blocks before Southend scored on the stroke of half-time. There was controversy over whether or not a touch off Demetriou from Fotune’s deflected cross travelled across the line before Posh ‘keeper Luke McGee grabbed the ball, but a well-placed assistant referee was adamant it had. Southend deserved their lead. Only two long-range shots from Marcus Maddison gave visiting ‘keeper Ted Smith any problems. Too often the Posh build-up was far too slow with Leo Da Silva Lopes and Samuelsen both guilty of over-elaborate moves in possession which would come to nothing. And it soon got much worse for Posh. A defence that has been admirably resolute by the standards of this club in recent seasons, has now started to fall apart. Fortune’s strength started to trouble Baldwin and one hoof forward and one flicked header was enough to send the visiting striker through on goal to make it 2-0 just past the hour mark. And four minutes later Posh looked to have survived Ranger powering past Baldwin again, until Michael Smith passed the ball casually in his own area which led to Wordsworth coolly converting a third goal from the edge of the box. McGee came to the rescue as Theo Robinson was clear in the penalty area ready to make it 4-0. Posh came close to a reply after a Maddison free kick was beaten away by Smith with the ball eventually landing at substitute Paul Taylor’s feet. His volley was superbly headed off the line by Leonard. Substitute Tom Nichols pulled a goal back for Posh 10 minutes from time, finishing well after a fine Maddison pass. Maddison tested Smith with a well struck free kick and Paul Taylor’s 25 yard shot was fumbled onto the crossbar by the Southend keeper. But Southend had the final word when Timlin, who became a father 24 hours earlier, finished from 12 yards after a Nile Ranger cut back. Posh: Luke McGee, Michael Smith, Andrew Hughes, Jack Baldwin, Ryan Tafazolli, Michael Bostwick, Leo Da Silva Lopes, Martin Samuelsen (sub Paul Taylor, 66 mins), Marcus Maddison, Craig Mackail-Smith, Junior Morias (sub Tom Nichols, 57 mins). Unused substitutes: Lee Angol, Brad Inman, Dominic Ball, Mark Tyler, Jerome Binnom-Williams. Southend: Ted Smith, Jason Demetriou, Adam Thompson, Ryan Innis, Ben Coker, Michael Timlin, Ryan Leonard, Anthony Wordsworth, Jermiane McGlashan (sub Theo Robinson 68 mins), Simon Cox (sub Nile Ranger, 74 mins), Mac-Antoine Fortune (sub Luke O’Neill, 84 mins). Unused substitutes: Josh Bexon, John White, Luke Amos, Frank Nouble. Goals: Posh - Nichols (80 mins). Southend - Demetriou (45 mins), Fortune (61 mins), Wordsworth (66 mins), Timlin (90 + 1 min).